Is it still new year on 9th Jan, oops 10thJan? Is it too late to clean the house and have it painted before Pongal next week? Is Linga still in theatres? Is it a bad start to the year to have slept in 7 of the first 10 days of the year, to have been late every day to school? Is it normal to want to make a new master to-do list for the year in Excel but not put “do-by-dates” for any of the items? Is it okay to make a birthday cake after the birthday? Is it terrible to plan to make Idiyappam and curry the night before, sleep early to wake up early but then wake up late and make oats the next morning and douse it in Hershey’s chocolate syrup? When I cleaned out my wardrobe yesterday, I found 2 categories of everything – tops, T-shirts and churidars I actually wear and those I hope to wear someday. Those that I used to fit into long back, that I wish I could get into now, that I hope to fit into someday soon, that I don’t have the heart to give away ‘cos that would mean I’d given up. Do you do that too? 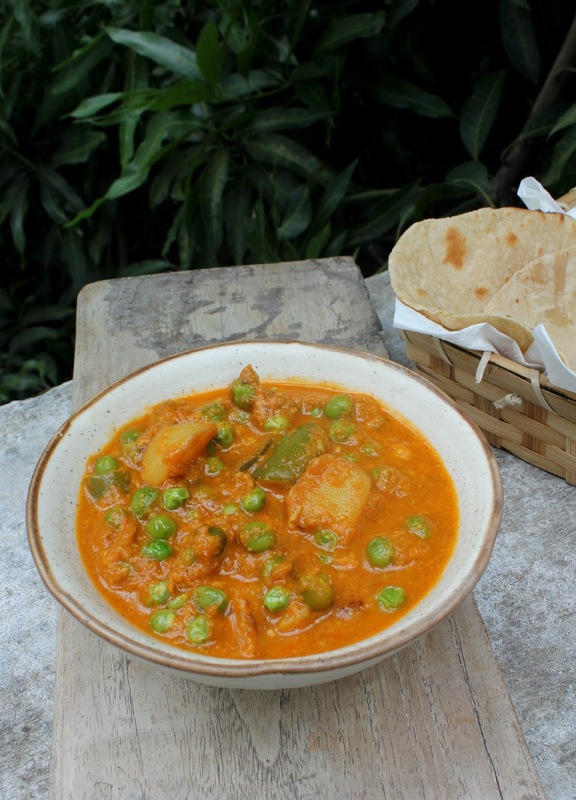 Is Capsicum Aloo Mutter celebratory enough for the first recipe of the year, though not cake, dessert or sweet? Do you also adore the aroma of capsicum as it cooks? But cook it just so, in the last few minutes before you switch off. Capsicum ought not to be overcooked, ever. Capsicum makes this curry lovelier. I added a dollop of fresh yogurt for just a hint of creamy tang, a pinch of garam masala to notch up the flavour and finally a dash of sugar to round everything out. Play around, taste as you go, you’ll know when you’ve hit the sweet spot. And hey, Happy New Year to all my readers. 1. Heat oil in a kadai/pan. When hot add the chopped onions and fry until they turn translucent. Add the ginger garlic paste and keep stirring. 2. When the paste is quite dry, add the yogurt one spoon at a time stirring briskly until it is all incorporated. When the yogurt is fully incorporated add the pureed tomatoes and mix well. Add the spice powders and salt and mix well. Pour about a cup of water and stir well. Drop in the potatoes. Cover and simmer for 15 minutes or till oil separates from the curry. 3. Add in the green peas and capsicum and turn heat to high. Taste and adjust seasoning. Add sugar and mix well. 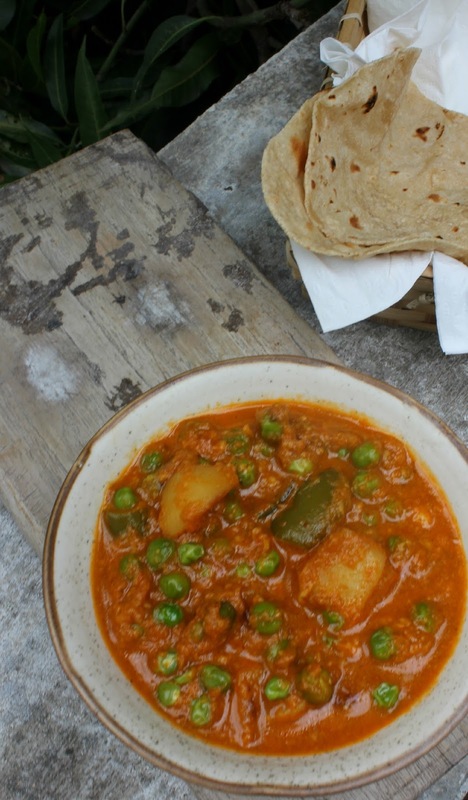 Cook till the curry thickens, the peas are tender – about 3-4 minutes. Mash a potato with the back of a spoon and stir it into the curry to thicken up the curry. Switch off. Serve hot with phulkas or chappathis. 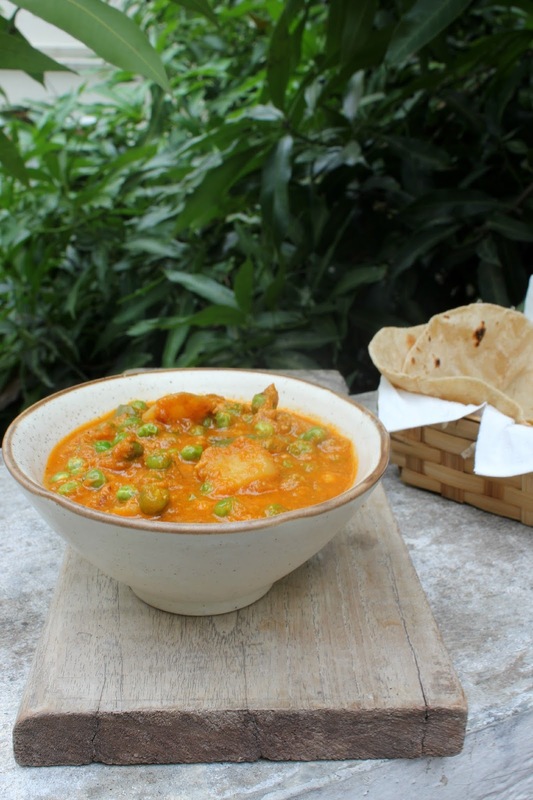 This entry was posted in Dals, Kormas & Gravies and tagged capsicum, capsicum aloo mutter, capsicum potato peas masala, gravy, potato and peas curry, recipe, veg gravy, veg side dish for roti and pulav.